(Newser) – Tensions in the Ukraine just keep escalating. 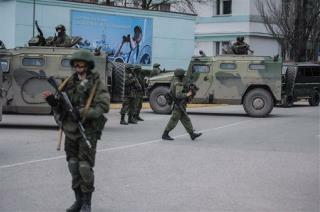 Although President Obama warned Russia not to send troops, Vladimir Putin today got official permission to do just that. The Russian president asked parliament to let him send forces to the "territory of Ukraine" to protect ethnic Russians in the region of Crimea and possibly elsewhere, reports AP. And in a not-so-surprising development, lawmakers agreed unanimously, reports CNN. Earlier, the pro-Russian prime minister of Crimea had made a formal request of his own for Putin's help. The Ukraine government in Kiev, meanwhile, says Russia already has sent 6,000 troops to Crimea, even if it hasn't acknowledged as much, reports the BBC. O needs to mhob and take care of his own. Putin sounds close to LBJ and a little stupid thing we did called the Gulf of Tonkin incident. Let's hope Putin does better at bat than LBJ did.